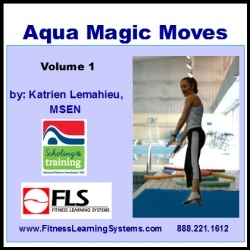 Learn about transitions in the aquatic environment and view recommended transitions for several Aqua Magic moves. Discuss and analyze basic changes in aquatic choreography with ways to increase and decrease intensity through the use of several principles and methods. Learn the advantages for teaching aquatic fitness from deck as well as safety and effectiveness for instructors teaching from deck. View and practice base moves, combinations, and transitions for a Jumping T-Jack. View and practice base moves, combinations, and transitions for a Soccer Jog. View and practice base moves, combinations, and transitions for a Tango Twist. Understand how to create countless options for base moves and combinations using the Aqua Magic Moves method.